Travertine tiles are a form of limestone tile that has had additional heat and pressure applied to it naturally. The formation of travertine is by minerals that have dissolved in ground water, which are then deposited on the earth’s surface by different bodies of water. Due to its formation process, travertine can be found in a wide variety of natural colours – primarily browns, beiges, greys and golds, however there is often a depth of other colours depending on the minerals that helped form the stone. 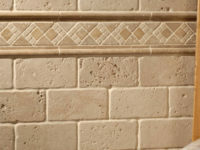 Travertine has been used for a long period of time for a range of applications, most notably as a floor tile. It is a durable, long lasting and beautiful looking natural stone tile and in modern applications it delivers a modern-yet-rustic alternative to other natural stone tiles. 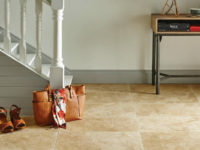 We have a large variety of travertine tiles available in our Reigate shop, each of them bringing something different to any room in your house. With the range of natural colours and undertones that are available, travertine fits with most colour schemes and designs and can further bring out the best of the room. 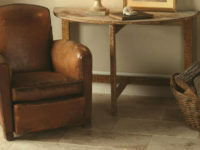 Travertine floor tiles not only come in a range of natural finishes, there are a number of different surface finishes that give a completely different look and feel to the stone – and your project. Honed – Finished with a smooth surface and square cut edges. 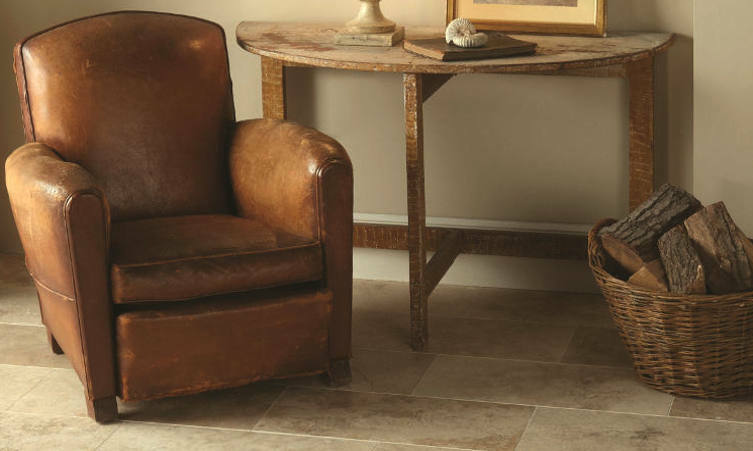 Tumbled – For a more rustic look a feel, a tumbled finish gives a worn look with distressed edges. Brushed – If tiles are being used in areas that are susceptible to getting wet a brushed finish is a good option. This finish gives a textured top to the tile resulting in extra grip. Polished – For a perfectly smooth and glossy finish. This finish is a very contemporary finish for natural stone tile but maintains the detailed and bespoke look. 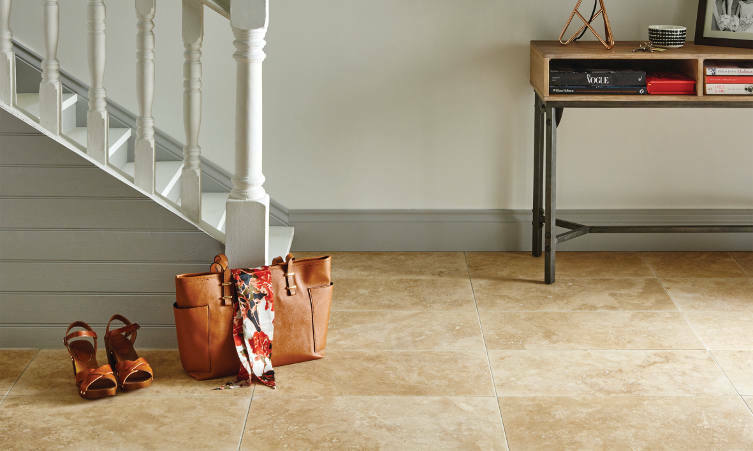 Whilst travertine floor tiles are a popular choice, to ensure their longevity and keep their natural appearance they require a certain level of maintenance. Below are a few helpful tips for the care and maintenance of travertine. 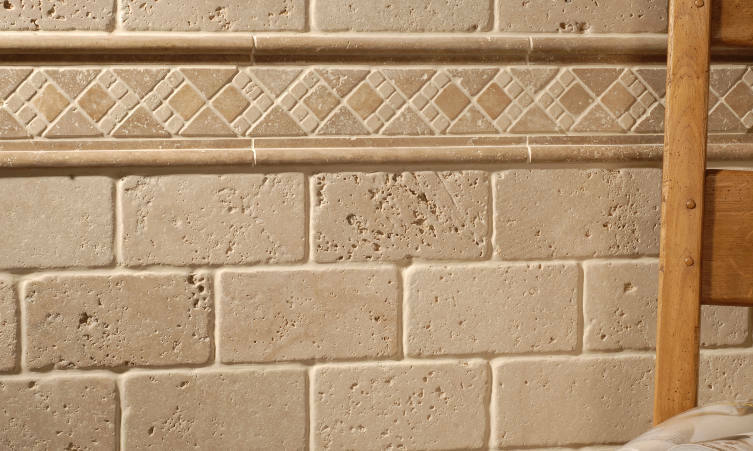 Sealing – Travertine is a porous stone so it should always be sealed before grouting or use. A deep clean and reseal should be completed every one to two years to ensure the tiles keep their full detail. Cleaning – You should regularly clean the tiles, however this needs to be done with a neutral (PH7) substance and clean water. Do not use acidic or alkaline cleaning substances as this will damage the tiles. Appearance – Avoid using a different coloured grout as this can result in a ‘picture frame’ look. 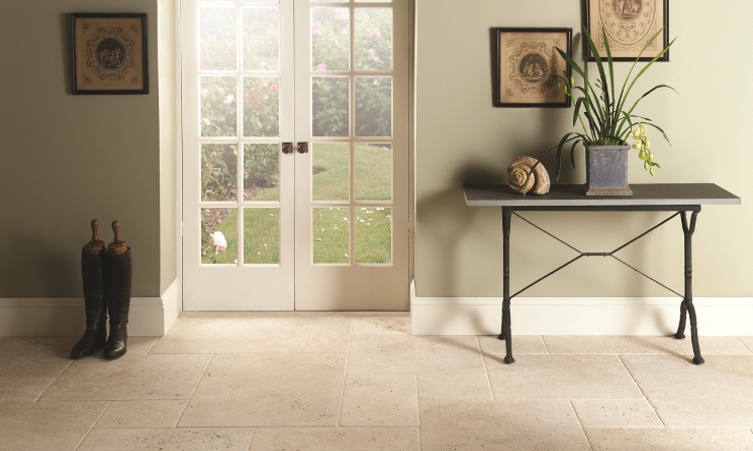 If you are planning to use the stone in a busy area, such as a hallway, consider a darker colour as they are easier to maintain.